8-CD box (LP-size) with 146-page hardcover book, 209 tracks. Playing time approx. 603 mns. 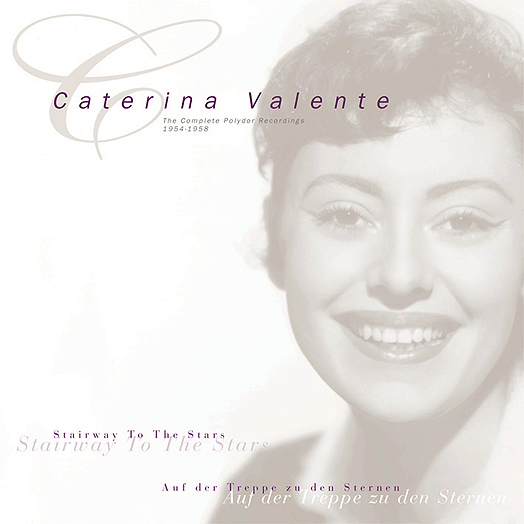 In 1954, Caterina Valente was a star in Germany, but had yet to break through in the English-speaking world. Then her record company had an idea which did not seem to hold much promise at the time, but proved to be the key that unlocked a great and extraordinary career. Her German language recording of Malaguena was released in the United States and became a major hit. The next single, The Breeze And I, became a Top 10 hit in both the United States and England. And so it began. 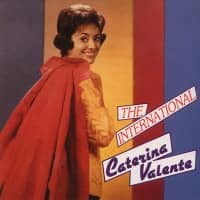 After several years of success in Europe (hits in Germany, Italy and the Netherlands, numerous TV appearances, as well as concerts at the Olympia Theatre in Paris), Caterina Valente launched her television career in North America with a guest appearance on the Perry Como Show. During the subsequent decades, she established herself as a worldwide recording star, TV star, and concert diva. 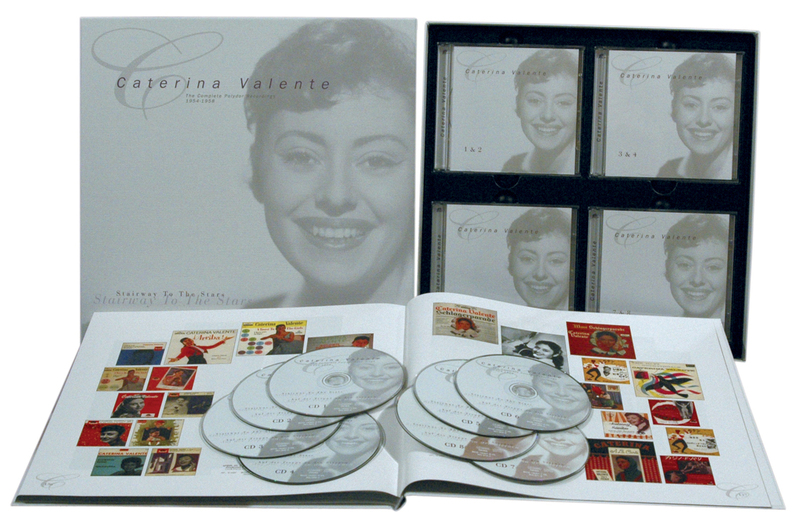 This boxed set documents the years between 1954 and 1958 when she recorded for Polydor Records. Here she takes her first steps up the 'Stairway To The Stars'. These 8 CDs not only include her big German hits, such as Cole Porter's I Love Paris, Harry Belafonte's Island In The Sun and all the other chart entries from Germany's 'Schlager-Parade,' but also include all of her early albums, proving once again why they are so highly regarded. 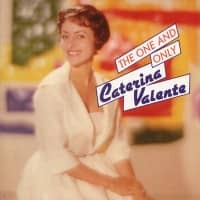 'A Toast To The Girls,' recorded with Kurt Edelhagen and his big band, and widely acknowledged as one of the first and most interesting concept albums from the Fifties; and two albums recorded by Caterina with her brother Silvio Francesco, featuring just their voices and guitars. The latter two albums are works of stilling beauty and simplicity that have endured for generations. 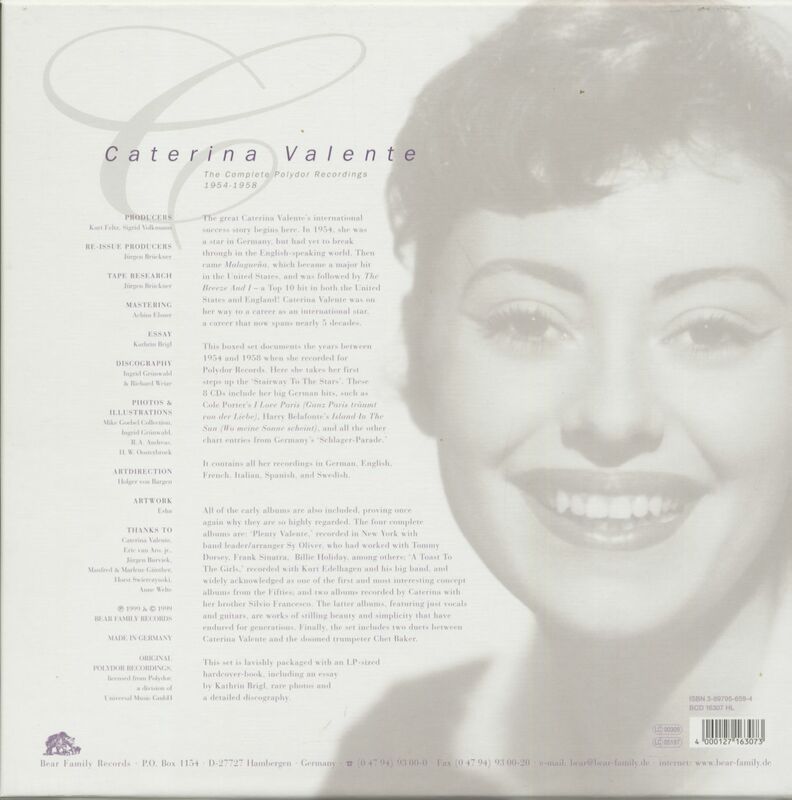 Another gem deserves to be mentioned: two duets featuring Caterina Valente and Chet Baker. The doomed trumpeter was rarely heard to better advantage than on this pairing. The set includes an LP-sized hardcover-book with rare photos and a detailed discography. October 25, 1929 was a'black Friday' for Maria and Giuseppe Valente, who had lived in Paris with their three children Nina, Pietro and Silvio since 1924. Maria Valente was successful as a variety star on the world's major stages and was so well-known in the USA that she wanted to live and work with her family there. The stock market crash prevented these plans, because the Valente family, like so many others, lost all their savings. So they stayed in Paris, where the youngest daughter of Maria and Giuseppe was born on 14 January 1931: Caterina. She admired her mother's versatility, perfection and great comedic talent. Maria Valente and her husband, an accordion virtuoso, also performed in important German variety theatres: the Hansa-Theater in Hamburg, the Scala in Berlin and the Friedrichsbau-Theater in Stuttgart. Here daughter Caterina was allowed on stage for the first time. She was five years old, danced in a ballet costume - a white tutu - and sang a song in French. When World War II broke out in September 1939, the Valente family was in Switzerland for a guest performance and, like all foreigners, were expelled by the authorities. The Valentes were not allowed to return to Paris because Maria and Giuseppe Valente were Italian-born, the family had Italian citizenship. The forced departure to Italy meant for the children that they learned the language of the country in which their parents were born. In her autobiography'Bonjour, Katrin!' 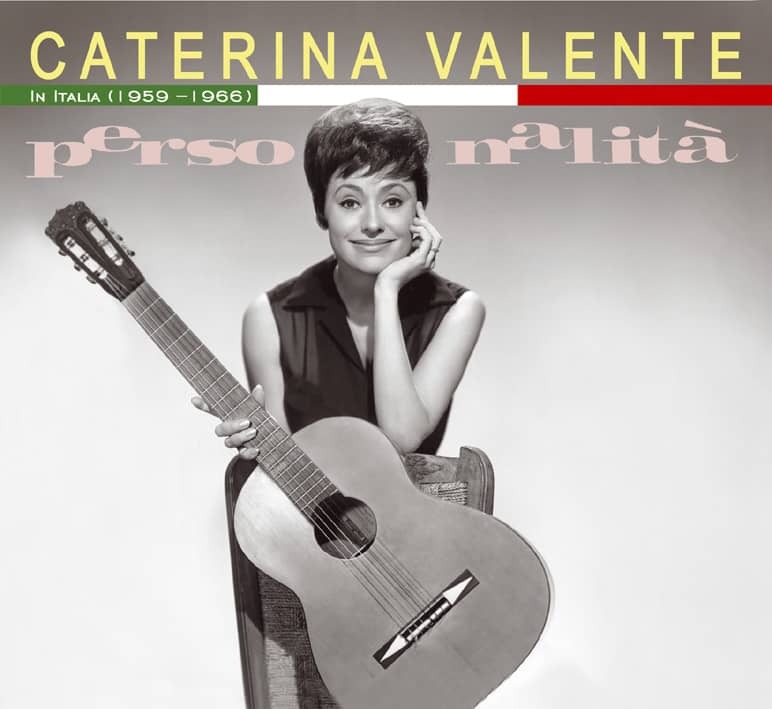 published in 1985, Caterina Valente describes the often very hard years of war and the early post-war years very impressively. On her way to her solo career, Caterina had to break the fierce resistance of her parents, and she had to cope with additional disappointments. Thus a promising project with brother Silvio and the young Gilbert Bécaud failed; and a guest performance in a Paris club ended after only one evening, because the young singer had also been asked for animation services. In November 1952 Caterina Valente and the German artist Gerd Scholz got married in Berchtesgaden. Scholz had worked successfully as a juggler under the name Eric van Aro before taking over the management of his wife. During a tour with the circus of the famous clown Grock, in which she appeared as a singer, the singer received an offer from Walo Linder, head of the entertainment department of Radio Zürich, in April 1953: he wanted to produce some songs of her choice for radio. Caterina's husband sent the recordings to German radio stations with Linder's permission. In Baden-Baden the bandleader Kurt Edelhagen, who is engaged with the Südwestfunk, heard the songs and recognized the singer's exceptional talent. After a test in the studio Edelhagen and his musicians knew that they had heard a highly talented singer who would make a huge career with the necessary portion of luck. 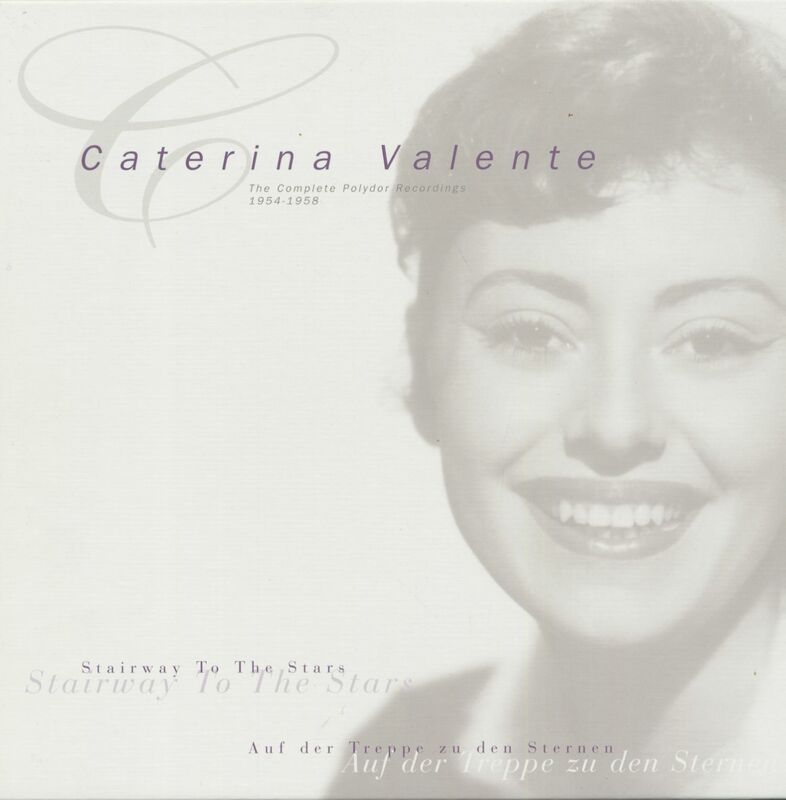 Caterina Valente made her first recordings for the Hamburg Polydor at the age of 23. Already at the end of the first year Caterina and Ganz Paris dreamed of love for her first German sung big hit, which was followed by many more, until today unforgotten Valente songs. The artist also celebrated her first major successes outside Germany. The compositions Malaguena and The Breeze And I by the Cuban Ernesto Lecuona from his'Adalucia Suite' paved the way for her international career. Between 1954 and 1962 12 movies were made. After three supporting roles, Caterina took the leading role nine times in films that very often sold out the big cinemas. She also conquered the then still new medium of television with flying colours. In 1957 'Bonsoir, Kathrin,' started the first personality show on German television. The show was so successful that more and more sequels were created. Many more own show series and appearances as a star guest in the shows of great colleagues all over the world followed. Also in the USA Caterina Valente conquered the audience with artistic perfection and charm. Along with legends such as Louis Armstrong, Perry Como, Ella Fitzgerald, Dean Martin and Danny Kaye, she was (and still is) a world-class entertainer. Bing Crosby was astonished at one of her performances: "Amazing, Caterina, how you glide not only through the music but also through the English lyrics - because you are actually Italian". 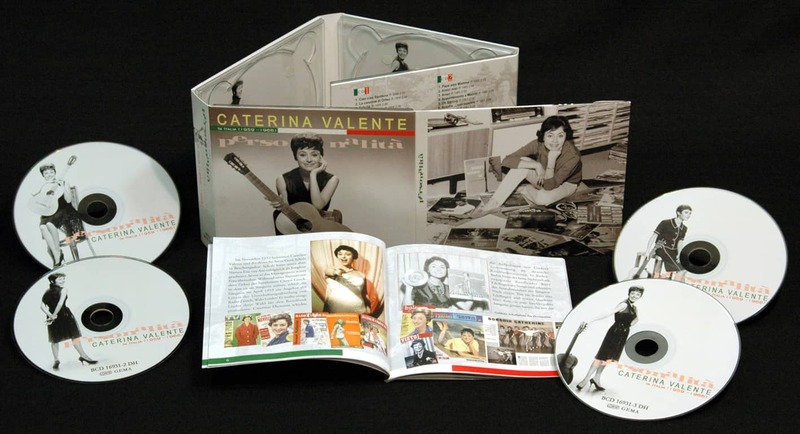 Customer evaluation for "Polydor Recordings 1954-1958 (8-CD Box Set)"
mit 209 Einzeltitel, Spieldauer 603:31 Minuten auch 8 CD's und einem Buch bekommt eine gewaltige Ladung Caterina Valente in höchsters Qualität serviert.